Arson is the crime of willfully or maliciously setting a fire for an unlawful or improper purpose. Arsonists set fires for a multitude of reasons, including vandalism, revenge, monetary gain, and mental illness. Whether used to cover up a crime, or as a violent act against another person's property, arson is a destructive method of achieving unethical goals. Beyond that, it carries the risk of severe injury, if not loss of life, to others. Arson risks both property and human life, and as such is destructive to the stable functioning of human society, and to the happiness of those within the society. Thus it is treated as a serious crime, and is punishable by severe penalties. Investigating and proving arson as a cause of fire is a difficult process, and the arrest rate for arson is fairly low. Reduction in the number of cases of arson is not to be achieved by changes in the law, penalties, or enhanced law enforcement. As with all crimes, solutions must be found on the level of human nature and human society. Arson has roots in Common law; in both England and colonial America, arson was a crime punishable by death. Under this law, arson is a crime of general, not specific intent, and thus all that is necessary to convict a defendant of arson is proof that they intentionally started the fire; there is no need to prove that they intended the fire to have a specific effect. Modern American arson law varies slightly from state to state, but most typically classify arson by degrees: first degree arson involves fires in homes, schools, or churches; second degree arson involves unoccupied structures and vehicles; and third degree arson involves personal property. Arson involving federal property or any property involved in interstate/foreign commerce is tried by the federal court system. Jail time for convicted arsonists varies, depending on the degree of arson, damage inflicted, or motive. Many states carry harsher punishments for those who attempt to defraud insurance companies. If the arson results in the death of an individual, arsonists may also face murder charges, resulting in a sentence of life in prison or even the death penalty. A forensic science, fire investigation seeks to determine a fire’s origin and cause. 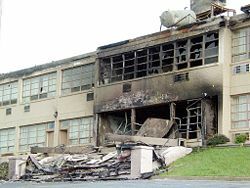 During a fire investigation, the investigator tries to uncover the source and path of the fire, using clues such as burn patterns. Arson investigators rely on knowledge of the "behavior of fire," the basic "fire triangle" of heat, oxygen, and fuel, the way the surrounding environment affects fire, and the different modes of fire to determine whether arson is implicated. The presence of an accelerant or ignitable liquid such as a petroleum distillate where it should not be can indicate an incendiary fire or arson. Specially trained dogs, known as "accelerant detection canines," help investigators detect trace amounts of accelerants that escape detection with electronic devices. Areas suspected to contain ignitable liquids are collected and sent to forensic laboratories to be examined, using techniques such as gas-liquid chromatography and mass spectrometry. Unfortunately, arson is one of the most difficult crimes to solve. Arrests are only made in less than 25 percent of arson cases. Arson occurs rather frequently, as the following numbers of cases of fires determined as set intentionally reveals. In 2005, the Federal Bureau of Investigation reported over 67,500 arsons in the United States, with an average monetary loss of nearly $15,000 per incident. The U.S. Fire Administration reported an estimated 31,500 intentionally-set structure fires that resulted in 315 civilian deaths and $664 million in property damage. During the twelve-month period ending in September 2005, England saw 67,900 arsons in primary residences, 41,400 vehicular arsons, and 533 arsons in schools. In 2003/2004, there were 57,200 fires reported as arson crimes in England and Wales, resulting in 1,468 individuals receiving sentencing in court. Canada reported 13,315 cases of arson in 2005. The majority of arsonists are young, single males. Juveniles are responsible for approximately half of all arsons in the United States, most of which falls under the category of malicious vandalism. Often, arson fires started by juveniles are trivialized, particularly because juvenile arson often involves small grass or brush fires. However, firefighters and others can still be injured responding to open-air fires, property is often damaged, and such so-called "trivial" fire setting behavior commonly escalates to include unoccupied sheds, garages, and other structures. Fires set in vacant buildings pose a real danger to firefighters, who must aggressively attack such a blaze in case transient or homeless people are caught inside. Revenge and spite are often cited as motivations for arson. Jealousy, domestic quarrels, and feuds are some of the types of situations that can cause an arsonist to manifest his anger through the destruction of another's property. Often, the purpose of arson is to provide the arsonist with some sort of monetary gain. The most well known example of this is insurance fraud, where a property owner sets fire to his own property in order to collect the insurance money. Another example is where a business owner uses arson to put a competitor out of business. Many commercial and vehicle arsons are profit-motivated. The image of the mentally disturbed pyromaniac is a popular one in fiction and film. In actuality, pyromania, a Diagnostic and Statistical Manual of Mental Disorders (DSM) Axis I-classified mental illness characterized by a strong drive to set fires, only accounts for approximately three percent of arsons. Often, fire-setting behavior may coexist with a psychiatric disability, but the disability may or may not have been a contributing factor in fire-setting behavior. Studies suggest that many arsonists, with and without mental illnesses, have a history of relationship and family problems. Arsonists are often at least partly influenced by a personality disorder, some traits of which may include: emotional coldness, paranoia, the need to be the center of attention, and an antisocial disregard for the safety of self or others. Some arsonists set fires that allow them to appear as heroes, rescuing endangered people or extinguishing the fire themselves. Ironically, there have been cases of fires intentionally set by firefighters, who then report it and attempt to appear the hero by fighting a fire that they intentionally set. Arson may be used to cover up evidence of a previous crime, such as murder or burglary. Arson has also been used as an extremist attempt to further political goals and support activist causes. From 1996 to 2001, a series of arsons were claimed by the Earth Liberation Front and the Animal Liberation Front. In Stockholm, Sweden, arson was used to protest a new, traffic-related congestion tax. Arson has been used to attack abortion clinics, as well as political headquarters. While arson may result in headlines and news coverage, it often does more harm than good for the causes the arsonists purport to care so deeply about. Environmental activists suffer the stigma of being involved in radical arson and other destructive acts, even when the vast majority works to change the world through peaceful means. ↑ Tom O'Connor, "Crimes against Habitation: Burglary, Arson, and Related Crimes," North Carolina Wesleyan College. Retrieved August 9, 2007. ↑ Thomas J. Bouquard, Arson Investigation: The Step-By-Step Procedure (Springfield, IL: Charles C. Thomas, Publisher, 2004, ISBN 0398074739). ↑ Kelly Andersson,. "Arson Dogs," Wildland Firefighter Magazine (1997) at WorkingDogs.com. Retrieved August 9, 2007. ↑ "Arson - Crime in the United States 2005," Federal Bureau of Investigation. Retrieved August 9, 2007. ↑ USFA Arson Fire Statistics, U.S. Fire Administration. Retrieved August 9, 2007. ↑ About the Arson Control Forum, Communities and Local Government. Retrieved August 9, 2007. ↑ Marie Gannon, "Crime Statistics in Canada, 2005," Juristat (Canadian Centre for Justice Statistics). Retrieved August 9, 2007. ↑ Chuck Biedka, "Arsonists start young," Pittsburgh Tribune-Review (September 17, 2006). Retrieved August 9, 2007. ↑ Insurance Information Institute, Arson. Retrieved August 9, 2007. ↑ "Motives for committing arson: part 1 - general arson," Australian Institute of Criminology (December 21, 2004). Retrieved August 9, 2007. ↑ "'Quiet start' for Stockholm congestion charge," The Local (January 3, 2006). Retrieved August 9, 2007. This page was last modified on 7 November 2012, at 20:26.